You made your name as a cocktail maker who uses scientific techniques to create great drinks. Do you have any formal training in science? Is there a particular scientific project you're working on now? How do you test your new drinks, in terms of their sensory properties? Distilling a rock, like flint, requires specialist scientific equipment. How did you, as a bartender, realise that this equipment was available? Do you see yourself as creating a product for your bars or do you have wider purposes, perhaps trying to change the way people think about cocktails? Do you collaborate with academics and scientists? What are your longer-term aspirations for your research? Tony Conigliaro is a London-based mixologist and owner of cocktail bars 69 Colebrooke Row and The Zetter Town House, both in London, UK. He also runs the Drink Factory, a bespoke lab that focuses on alcohol-development and research into liquid flavour, drinks and cocktails. Widely acknowledged as one of the UK's pioneering drinks creators, he won the award for International Bartender of the Year 2009, as well as the Observer Food Monthly award for Bar of the Year in 2010. His new book, Drinks, is released later this year. In a Q & A with Flavour, Tony Conigliaro talks about the scientific methods and equipment he has brought into cocktail making and some of the new drinks he has created. My background isn't in science. I did Fine Art and Art History for years at University and college, so I think that took care of the creative side of things. But as for the science, I'm more of a magpie, I suppose – I pick up bits and pieces as I go along, but over the years we've built a collection of people whom we can ask specific questions, so if we ever get stuck with a line of thought or there's something we don't understand, those people will jump in and help us out. Beyond that, we've never really been afraid of asking questions. If we don't have the answer, we find someone who does and actually ask, and we aren't afraid of asking until we find out the answer to the question. I've been working in the bar cocktail industry for sixteen years now. There was, you might say, a pivotal moment where I was in the kitchen in Isola in Knightsbridge back in 1999 and I was trying to make a fresh puree. I was kind of obsessed with fresh purees back then because all the ones that we were buying had too much water, too much sugar in them, and I wanted to add that fresh element. I think we were working on Bellinis at the time, and the pastry chef came over and just shook his head at me and said “That's not how you do it”. He threw everything in the bin and said “This is how you do it”. From that point it really opened up an avenue of what was possible in the kitchen and how that affected the quality of what we were using. That led at a slightly later stage to asking questions such as “How can we do this better?” and “Why does this work?”, which inevitably led to talking to food scientists and people who were very well versed in preparing food. That really opened up the door; I suppose once you start asking those questions there's no turning back; there are always more questions than you can actually answer, so it's a perpetual motion of finding things out. For the past year and a half we've been looking at flavours that are at the fringes of what you taste, what you experience, and then looking at how those work in drinks. We've recently been focusing on terroirs in wines - how flint stone affects the flavour of wine. For example, if it does affect the flavour, how, and if it doesn't, why not? What is actually happening? So we've been doing a lot of that sort of research, and last year we started distilling powdered flint stone in our vacuum still, which actually produces a flint stone note and a flintstony, minerally flavour. So it's almost like we're adding terroirs to cocktails in a way, and we've started looking at chalks and clays and things like that, which has obviously been really interesting because we've been working with some wine connoisseurs who specialise in terroir. It's also beneficial for us to work out when certain flavours arrive and why they arrive, where they're coming from and why they are there, because it gives us an idea as to how well we can replicate that into a cocktail. One part is ”Where are these flavours coming from and how do they work?” and the second part is “When do they work?”. We can create a progressive line of flavours. One of the drinks, The Sirocco, is based on that theory of where the flavour will appear, or register, in your mouth. It's got a grapefruit note followed by a pink peppercorn note, which is really interesting because it registers as sweet but then as incense, and then there's the flint note. You can almost read them on your tongue like a story, in that order. If you look at the size of the molecules and the way they work, they're almost progressionally small to big, and then we put a benzyl syrup underneath to smooth it out and tie it all together. That ties in with the second part of the process, working out where the flavours are arriving and how to describe the journey of those flavours. I suppose that's the romantic part that's not so scientific, but it only works by knowing the science. When designing the drink, there's a theory which we look at, but we also consider the different elements, and then it's just testing and seeing how they work, if they work, and then making minute adjustments to all the variations of every amount you put in. So, for example, the flint: you put very little flint in, but you put in more pink peppercorn and less grapefruit. When we first made the drink it was all kind of higgledy-piggledy and everything was either too big or too small, so it's just balancing it out. Then you've got the structure of how they work together. Also, you've got flavour by itself, which reacts in one way, but flavour with alcohol can work in a completely different way, and flavour with another ingredient might do something else entirely. Everyone here tries everything incessantly until all of us are happy with it. Anyone who walks in here, we usually go “Taste that”. We always test things on people before we put it on the menu, sometimes randomly, and see what they think, unless we think it's amazing first off and we just have that feeling that it's going to work. But we test some of the more experimental varieties a little first to see where they register, and if we've made a huge mistake, it's quite frightening. Sometimes the drinks can take up to six months or longer - there was one drink that took two years just to get right. One of our main pieces of kit is the Buchi Rotavapor, which we've got two of and use practically every single day for distilling various different tinctures or other things. I first came across it after a friend of mine had actually worked with Jordi Roca over at Roca Can Celler in Girona. When I saw it I just thought, that kind of belongs to us. In essence, it's a still that we can make our own ingredients with. So I was lucky enough that the guys at the Fat Duck had one which they let me use every now and then on Sunday afternoons. I remember it was in the back room in the lab, and I'd just sit in the back room distilling things, which was very generous of them. But then I realised how much potential it actually had for what I wanted to do, which was create flavours you wouldn't necessarily find in cocktails or spirits, so I bought one, and I suppose that was the start of the collection. Things like the vacuum machine and the centrifuge came later, but I was influenced by what I was seeing other people use. The Rotavapor is basically a lab still; it works on the same principle as most other stills, but it works under vacuum, so it allows you to distil stuff at a very low pressure. You're boiling food pressure rather than heat, so if you're doing very delicate things like roses, for example, the heat source won't damage the chemicals in the rose, which allows you to achieve a very clean, more complete imprint of that rose on the other side of the distillate. You use a scientific method, did this come naturally to you or was there a process where you thought you needed to be more rigorous about how you treated cocktails? I don't really see the process as scientific, but I suppose it is in a way; it had to become more rigorous. The best example of this is when I finally got myself a vacuum still. I literally put everything I could possibly find through it just to see what would happen, and there was one particular flavour that I put through, I forget what it was now, which was absolutely magnificent, but I hadn't written anything down so I've never been able to replicate it since. I've tried millions of different variations but it just doesn't come out the same. It was from that point I realised that the process needed to be more rigorous for numerous reasons; firstly, just so we can replicate it, so that we're not repeating ourselves and we get regular results, but also in the bars it means you can then create something very accurately, very quickly and repeat that over and over again. Both, I think. I really like the idea that we have very bespoke ingredients at the bars because there's a uniqueness there, but it also betrays what we're trying to do. There are ingredients that aren't out there that I would like to use which would bring a whole new kind of space to cocktails; you can't, for example, go out and buy a flint vodka, whereas making a flint vodka introduces an entirely new and different way of doing things to cocktails. Yes, we do. We talk a lot with various different field scientists and academics. Not necessarily in the field of food, far more than that; we work with perfumers, we work with perfume technicians, we even worked with an architect recently. So it's very varied and it all feeds back into what we do. For example, there was one thing in particular that Hervé This had written about that I was very interested in, because it looked like the answer to my question but I didn't really understand how it worked. I had got back from the bar I was working in very late one night and put a draft email together of a whole load of really jumbled questions. But instead of saving it as a draft, I actually sent it to him. I was mortified. I could hardly sleep that night thinking “Oh my god, you know he'll never answer this”. But by the time I'd woken up he'd actually answered it, understood it and written answers to all the questions. I think people are as enthusiastic about what we do on the other side, so it's just a question of asking them and the enthusiasm comes back. We're going to investigate terroir because it is so fascinating. I'm very interested in the idea that minerals can register on your palate when you drink mineral water and what happens with that, because that can open up whole new avenues. A really good example of this was when we did a test where we were running electrodes through various vermouths and gins to change the flavours, which was really interesting because for a limited period the actual flavours would change in the drink. Then we started putting in silver rods and we made colloidal silver in some of the spirits. One drink we made was called the silver phantom, which was a martini with colloidal silver in. It had this shimmer that registered as a slight metallic note, almost like blood in a way, it had that kind of tingle in your mouth. But that, paired with the juniper and the gin, was fantastic because it made the juniper sing, almost like a high pine note, and that was very exciting. It had a real visual act to it too, because it had that shimmer. The whole idea of changing flavour through electricity was intriguing, but it was too limited for us to actually do in the bar. I mean we could have electrodes in the bar, but health and safety might get a little bit worried about that. Tony Conigliaro is a mixologist, bartender and bar owner who has pioneered a scientific approach to cocktail making. He has created several new drinks including the Twinkle, Spitfire, Oh Gosh, and a re-invention of the Prairie Oyster and Bloody Mary, many of which appear on menus across the world. His cocktail bars in London, 69 Colebrooke Row and The Zetter Town House, were winner and runner-up in the Observer Food Monthly Bar of the Year in 2010 and 2011, respectively. His new book, Drinks, is published in 2012. 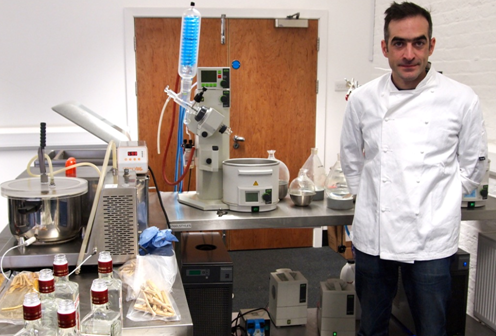 Tony Conigliaro is the owner of 69 Colebrooke Row and The Zetter Town House, cocktail bars in London, and the Drinks Factory, a laboratory that researches liquid flavour, drinks and cocktails.